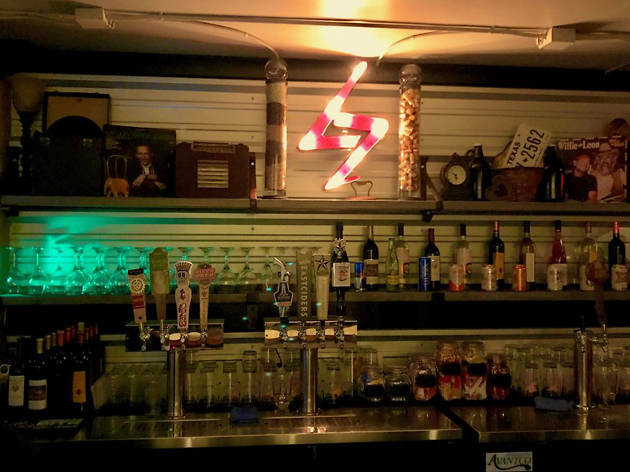 You won't know you've arrived at the Good Life Bar Bar—and yes, that's two 'bars' in its name—until you've entered a small iron gate at the Brazos Lofts building on East 5th Street, one with a red light poised above the door. Is the red light on? Good—you can proceed. If it's not, you'll have to find another hidden speakeasy to frequent for the night. Pass through the door and head down a flight of stairs, where you'll pass by the Good Life Barber Shop. Keep going (unless you need a trim) until you reach another door (so many doors!) with a peephole, beyond which lies a small, dimly lit room where local craft beer and Texas wines flow like, uh, wine. The expertly curated craft beer list features suds like Uncle Billy's Cluster F&*k, Zilker's Chaos Magic Sour, Big Bend's Chocolate Porter, Strange Land's Austinite Pils and more. Looking for liquor instead? Bar Bar, which opened in August, doesn't sell hard stuff, but it encourages you to bring your own bottle (the liquor store on the street next door offers a "Bar Bar discount"), which the friendly staff will use to mix up cocktails for your crew at $10 per person. When it comes to the Texas wines, owner Brian Hummel is happy to walk you through each varietal. And then, of course, there's the lipstick wall. A brick wall lines one end of Bar Bar, with lipstick kisses smattered along every other brick. It's a relic from the past—or so a sign on one end of the wall explains. "Who's lips are these?" the sign asks, before going on to explain that a few kisses were already on the wall when the owners took over the space in 2006, meaning they could have been there since 1925 when the Brazos Lofts building was originally constructed, or when the space served as an after-hours club in the early aughts. Either way, you too can leave your mark. When I ask Hummel for some lipstick, he pulls out a box of Wet n Wild tubes in a variety of shades (Tip: The darker shades last on the bricks longer). "Don't worry, they're new," he says. "And you can keep it." One brief smooch with a brick later, and my mark has been made. With the promise of a glass of free champagne with every kiss, it's hard to reason why anyone wouldn't do it. Bar Bar also happens to be the only Washington State Cougars home bar in Austin, where fans can gather for game watches and Pac-12 pub crawls. Popping in on a Tuesday? The bar celebrates Taco Tuesdays, with $2 tacos and $4 micheladas from the Trejo Taco Truck. Tacos, cougars, great beer, lipstick kisses—we're sold. 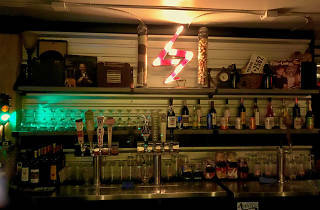 The Good Life Bar Bar is located at 201 E 5th Street, Unit 100B, in downtown Austin. Hours are Mon-Fri 3pm-midnight, Sat 2pm-midnight.